Scanning electron microscope images of (a) SiO2 nanofibers after drying, (b) SiO2 nanofibers under high magnification (c) silicon nanofibers after etching, and (d) silicon nanofibers under high magnification. Researchers at the University of California, Riverside's Bourns College of Engineering have developed a novel paper-like material for lithium-ion batteries. It has the potential to boost by several times the specific energy, or amount of energy that can be delivered per unit weight of the battery. This paper-like material is composed of sponge-like silicon nanofibers more than 100 times thinner than human hair. It could be used in batteries for electric vehicles and personal electronics. The findings were just published in a paper, "Towards Scalable Binderless Electrodes: Carbon Coated Silicon Nanofiber Paper via Mg Reduction of Electrospun SiO2 Nanofibers," in the journal Nature Scientific Reports. The authors were Mihri Ozkan, a professor of electrical and computer engineering, Cengiz S. Ozkan, a professor of mechanical engineering, and six of their graduate students: Zach Favors, Hamed Hosseini Bay, Zafer Mutlu, Kazi Ahmed, Robert Ionescu and Rachel Ye. The nanofibers were produced using a technique known as electrospinning, whereby 20,000 to 40,000 volts are applied between a rotating drum and a nozzle, which emits a solution composed mainly of tetraethyl orthosilicate (TEOS), a chemical compound frequently used in the semiconductor industry. 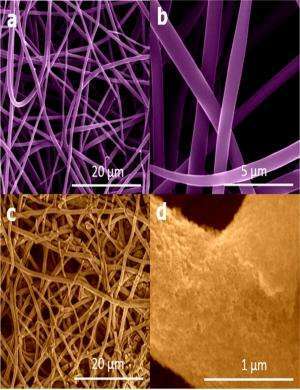 The nanofibers are then exposed to magnesium vapor to produce the sponge-like silicon fiber structure. Conventionally produced lithium-ion battery anodes are made using copper foil coated with a mixture of graphite, a conductive additive, and a polymer binder. But, because the performance of graphite has been nearly tapped out, researchers are experimenting with other materials, such as silicon, which has a specific capacity, or electrical charge per unit weight of the battery, nearly 10 times higher than graphite. The problem with silicon is that is suffers from significant volume expansion, which can quickly degrade the battery. The silicon nanofiber structure created in the Ozkan's labs circumvents this issue and allows the battery to be cycled hundreds of times without significant degradation. "Eliminating the need for metal current collectors and inactive polymer binders while switching to an energy dense material such as silicon will significantly boost the range capabilities of electric vehicles," Favors said. This technology also solves a problem that has plagued free-standing, or binderless, electrodes for years: scalability. Free-standing materials grown using chemical vapor deposition, such as carbon nanotubes or silicon nanowires, can only be produced in very small quantities (micrograms). However, Favors was able to produce several grams of silicon nanofibers at a time even at the lab scale. The researchers' future work involves implementing the silicon nanofibers into a pouch cell format lithium-ion battery, which is a larger scale battery format that can be used in EVs and portable electronics. Unfortunately, it seems that every other week some paper is being published that says it will revolutionize the battery industry and enable renewable power to be that much more effective. I just haven't seen much evidence that any of these claims have had much, if any, impact on the commercial battery industry. There is always a catch. For this one, its probably still cycling efficiency. They claim to have: "allows the battery to be cycled hundreds of times without significant degradation." Just what exactly is "hundreds" and just what exactly is "significant degradation"? The fact that they don't want to be any more specific on these two terms says a lot. Probably need a cycle lifetime measured in the thousands of cycles before major players in the battery world start to take interest. Would you buy a gas car that needed a new gas tank every two years? It gets frustrating, doesn't it? On the other hand, there are so many announces that at some point one of them won't be complete BS and will turn into an actual breakthrough.